Bahir Dar is both overrated and underrated. I was initially keen to visit because of the churches and monasteries found on the islands of Lake Tana, but my fondest memories of the town are actually chilling by the lake, eating fish and just soaking up the sun. That is not to say that the churches and monasteries are bad, but rather, they are repetitive and there are much better examples of similar artwork in Gondar and beyond. It’s hard to get a picturesque shot of the shores of Lake Tana, but a sunset will do. 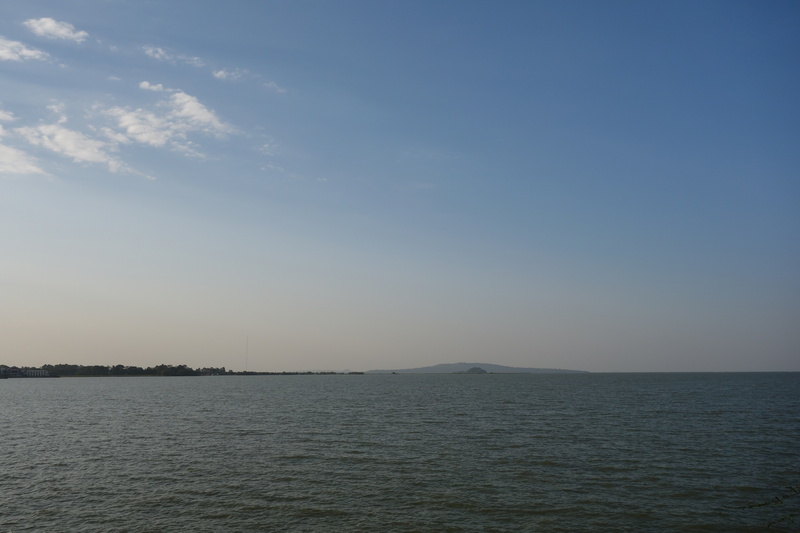 Lake Tana is the largest body of water in Ethiopia. Because there are no inflows from other lakes, and because the only outflow is obstructed by the Blue Nile Falls (which I’ll get to later), the lake is home to a unique range of fauna. The subspecies of the Nile tilapia found only in Lake Tana has become somewhat of a staple in the region and serves as a great break from the repetitive cuisine elsewhere in the country. Men fish for the tilapia on kayak-like boats called tankwas. They’re made of papyrus reeds, bound at each end to get their shape. Interestingly, the boats aren’t watertight but instead incredibly buoyant. I’m guessing the fishermen probably have to put up with wet bums. A mad paddles his tankwa on Lake Tana. Anyway, the point is, fish are a big deal here. Walk a few blocks back from the shore and you’ll find streets lined with women frying fresh fish. As per usual, you eat with your hands, but in these particular shacks, injera is not included. What you do get, however, is beri beri and/or vinegar for dipping. The whole thing costs about $1.50, which is amazing for a whole fish. But more importantly, it’s delicious. The backstreets of Bahir Dar are lined with shacks frying up fresh tilapia. Fresh tilapia being fried in a shack by the roadside. To get sides such as injera or rice, try a regular restaurant instead of a shack. The fish will still be cooked the same and taste just as good. The handful of these restaurants that English menus also offer something called “fish goulash”, which turns out to be disgusting fried offcuts and nothing like goulash at all. This is what you get at a restaurant rather than a shack (note that restaurant here just means somewhere with a proper kitchen; it could be nice or dingy). The injera, rice and salad suit the fish well! More interestingly, they also offer grilled and steamed tilapia, which is served in foil which is set alight. The spectacle is cool, and again, the food is nice and unique. Despite being the fanciest restaurant I visited in the country, meals only set you back about $10. The two main churches/monasteries are actually not on islands, but on the Zege Peninsula. Bet Maryam and Azewa Maryam were both founded around the 13th century with paintings from the 16th century, and are both very similar in appearance. To be honest, the circular structures are nothing special but the paintings inside are still beautiful. It was interesting to see immediately-recognisable biblical scenes represented in such a different culture to my own. That being said, these same depictions were repeated in every church I visited in the area and after it got boring after a while. Another issue with these churches is that they’ve been turned into tourist traps. This was the only place in Ethiopia where I was harassed to buy souvenirs, and the paths leading to each church were lined with stall after stall selling the same exact trinkets. It’s like being in South East Asia, except somehow not fun. This is Bet Maryam, but it may as well be Azewa Maryam or any other church on Lake Tana because they’re all so gosh darn similar-looking. Despite being packed with local and foreign visitors, the churches still manage to maintain their serenity. Pictured here is Bet Maryam. The paintings are gorgeously vivid, I’ll give them that. Bet Maryam. I made my own triptych! Biblical scenes depicted in Bet Maryam. To visit the churches, head down to the wharf in Bahir Dar and before long you’ll have people offering you a spot on different boats. The big mistake I made was not asking how powerful the motor was; this might not sound important, but I ended up with what appeared to be the slowest boat which made the journey across the lake painstakingly long. Every other boat’s motor taunted me with a much higher horsepower rating. After these churches we visited a few smaller ones on different islands, but they all ended up being built in the 20th century to replace older monasteries that had burned down. Suffice to say, they were a complete waste of time. The only thing resembling the frescoes of the other churches were collages of tacky posters depicting Jesus and Mary. These newer churches still have detached ‘museums of church treasures’, but they’re more or less identical to the museums attached to the better churches. I’m going to name the two I visited just so you you don’t visit them by mistake: Entos Eyesu and Debre Maryam. The photos below are of Azewa Maryam, one of the aforementioned good ones. I’m not sure if the more remote churches further across Lake Tana are worthwhile, but from my experience with the closer ones, I’d give them a miss. A priest and a bunch of faranji shoes outside Azewa Maryam. Biblical scenes depicted on the walls of Azewa Maryam. Almost every surface of the churches are painted. The other main attraction of Bahir Dar wasn’t disappointing, however. The Blue Nile Falls are said to be at their best during the wet season (July-October) but my visit in January, during the peak of the dry season, was still really rewarding. To see them, you have to go to Tissisat, where you can hike across the Portuguese Bridge and over a hill to see the waterfall. The bridge, which was built by Jesuit missionaries in 1626 and is the oldest in the country, was unfortunately covered in scaffolding when I was there. Even in the dry season, the immense power of the waterfall is quite overwhelming. You’ll be sprayed by water from as far as 20 metres away. The Blue Nile was also quite beautiful as a river, even if it was at only a fraction of its capacity, while the farmers herding their cattle only adds to the atmosphere. This picturesque waterfall flows into the Nile! The markets are another attraction in town, but while I can’t resist wandering through piles of fresh produce and grains, it doesn’t compare at all to Merkato. When I was there, there was another tour group also vising. Because of this, every stall owner I passed quite frantically pointed at the group as if I were being left behind, which they found pretty funny when I told them I wasn’t with the group. It’s just another example of the constant hospitality that I experienced in every corner of the country. Bahir Dar is generally a nice town. The colourful boulevards are lined with palm trees and it’s home to Ethiopia’s only waterfront. It’s clearly a town that’s used to local and international tourism. It’s such a shame then, that the main attractions are so underwhelming. Should you still go there? Probably, seeing as it’s between Addis Ababa, Lalibela and Gondar. If you’re catching a bus between any of those places, you’ll probably need to break it up into two trips and Bahir Dar is both the most convenient and least unremarkable town to do so in. But just know that you’re going there for the fish, not the churches. The church paintings go well into the ceiling. Pictured here is Bet Maryam. Religious crowns worn by members of the clergy at Bet Maryam. A painting at Bet Maryam. “Paintings” at Debre Maryam, one of the crappy, modern churches. The Portuguese Bridge spanning the Blue Nile was built by Jesuit missionaries in 1626. The Blue Nile flows at a trickle in January. Sunset over the Blue Nile Falls. The Blue Nile nicely reflects the light at dusk. Closeup of the Blue Nile Falls. Cattle and faranji roam around the Blue Nile Falls. A suspension bridge near the Blue Nile Falls. The backstreets of Bahir Dar are nice to get lost in. The quaint backstreets of Bahir Dar. Amazingly, people grow crops on this sliver of land on the shore of Lake Tana. An abandoned hotel overlooking Lake Tana. Sunset near the Blue Nile Falls.